September 2015 will mark the 20th anniversary of the adoption of the Beijing Declaration, a landmark convention on women’s rights. Over the last two months, UN member states and civil society organizations have accelerated their review of the progress achieved and the challenges that remain. According to UN Women, member states have “recommitted themselves to Beijing at national-level reviews … which feed into regional-level assessments by the five UN regional commissions.” Four of these reviews were held in November 2014, and the last is scheduled for February 2015. The findings from these reviews will be presented in March 2015 at the 59th session of the Commission on the Status of Women. While the agenda for this session and other events commemorating the 20th anniversary are still taking shape, there is an urgent need for a broader framework to advance women’s health. To date, approaches to women’s health have largely focused on health issues encountered during pregnancy and motherhood. Unfortunately, there are many other challenges to women’s health. In her 2010 article in Slate magazine, science journalist Melinda Wenner Moyer described the bias against health research on women . Moyer pointed out that although more women die from cardiovascular disease (CVD) than men, women made up less than 47 percent of the subject pool in CVD clinical trials. Sadly, little has changed over the last four years. According to the World Health Organization, CVD is still the number one killer of women. Approximately 8.6 million women die from heart disease each year. Prevention and treatment services provided to women are often inadequate. The World Heart Federation has found that women are less likely to be prescribed aspirin to prevent a second attack, less likely to receive sophisticated pacemaker models, and less likely to be recommended for potentially life-saving cardiac surgery than men. Cancer is another threat to women’s health. While some advances have been made in the diagnosis and treatment of breast cancer, most women with ovarian cancer die prematurely because of inadequate care. A study conducted in the United States found that only one-third of patients received treatment that aligned with U.S. and international guidelines. The New York Times described how the “widespread failure among doctors to follow clinical guidelines for treating ovarian cancer” leads to tragic consequences. Ovarian cancer is only diagnosed in less than one-fifth of actual cases but causes at least 140,000 deaths worldwide each year. Infectious diseases also present a threat to women’s health. According to the WHO, “Tuberculosis (TB) kills more women annually than all the causes of maternal mortality combined” and is the “third leading cause of death among women aged 15–44.” Men are more likely to be diagnosed with TB, but women of reproductive age are more likely to develop active TB than men of the same age. Because TB is a disease of poverty, the chances of women contracting TB are greater than men because 70 percent of the world’s poor are women. Emerging diseases have also taken a toll on women’s health. Because women compromise the majority of primary caregivers, nurses, and laundry workers in hospitals in West Africa, women have been disproportionately affected by the current Ebola outbreak. Although studies have confirmed that men and women are equally vulnerable to Ebola, women are more likely to undertake tasks that expose them to the virus, such as washing a relative’s corpse before the funeral. Because the risk of exposure is greatest when an Ebola patient is very ill and after he or she has succumbed to the disease, women need protective clothing and equipment to safeguard their health. However, some reports have suggested that even women working in clinical settings are “not provided with sufficient protective gear compared with the protection given to male doctors … who are widely considered the experts, thus deserving more protection.” Unfortunately, the lack of access to basic supplies, such as rubber gloves, facilitated the spread of Ebola. 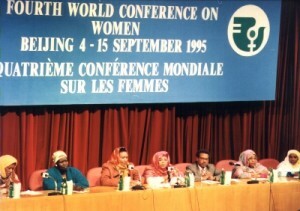 In September 1995, the international community agreed to “ensure equal access to and equal treatment of women and men in … health care” by signing the Beijing Declaration. Now it is time to mark the anniversary by launching a broader approach to protecting the health of women that directly addresses the key threats to women’s health.